A reception will coincide with the opening of David Prehm’s “Get Connected, No Password Required” exhibit from 3:30-5 p.m. at Upper Iowa University’s Bing-Davis Memorial Gallery in Fayette on Thursday, Aug. 27. A New Hampton artist will kick off Upper Iowa University’s 2015-2016 Bing-Davis Memorial Gallery schedule. A longtime Iowa educator, David Prehm will open “Get Connected, No Password Required” on the Fayette Campus at 3:30 p.m. on Thursday, Aug. 27. A deep appreciation for his Iowa roots, and the sports, nature, and visual arts that have been a constant part of his life can be viewed in Prehm’s artwork. While becoming an All-American wrestler at University of Northern Iowa in the late-‘70s, he also found success in the art studio. Prehm completed his visual arts degree in 1979 with an emphasis in drawing and print making. A 35-year education career in Iowa began at North Scott High School in Eldridge, before he moved to teach and coach at Britt High School. It was during his time at Britt he also began graduate work at Mankato State University in Minnesota. After earning a master’s degree in studio arts, with an emphasis in painting, Prehm held a solo thesis show and began to teach and coach in New Hampton. 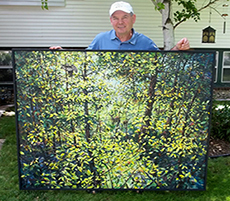 In addition to earning numerous awards and commissions, Prehm has exhibited solo art shows at numerous locations, including Lakes Art Center in Okoboji, Iowa; the Owatonna Art Center in Minnesota; the Witter Gallery in Storm Lake, Iowa; Warburg College in Waverly, Iowa; North Iowa Area Community College in Mason City, Iowa; and Luther College in Decorah, Iowa. “As a former art educator, I intentionally produced works of art that explored many methods and ideas. I truly love working with clay, stone and metal as much as printmaking and painting,” Prehm noted. “I wanted my students to experience a variety of styles and understand the breadth of possibilities, although it is in my sketchbooks where you will most likely find my most creative images and thoughts. Today, the local artist acknowledges being in the process of “turning a page” in his life and creating art with greater depth and purpose. Teaming up with author William Green, Prehm recently completed the illustrations for two new children’s books, “Thank you, Mr. Brown, and Merry Christmas” and “Summer at Izzie’s.” Over 500 of his paintings have found their way into private and public collections primarily throughout the Midwest, but also in Norway, France, Czech Republic, Japan, New Zealand and Australia. A reception will coincide with the opening of David Prehm’s “Get Connected, No Password Required” exhibit from 3:30-5 p.m. at Bing-Davis Memorial Gallery on Thursday, Aug. 27. Prior to the reception, the artist will host a gallery talk and discuss his exhibit from approximately 2:20-3:30 p.m. The exhibit will remain open to the public during regular gallery hours through Friday, Sept. 25. The complete 2015-2016 Bing-Davis Memorial Gallery schedule can be viewed online at www.uiu.edu/ocm/news/2015/aug/bing-davis-schedule.html.